(TibetanReview.net, Aug18, 2014) –China has launched a campaign to push harder its policy of encouraging marriages between Tibetans and Chinese in an apparent attempt to assimilate Tibetans and stamp out rebellious impulses, reported washingtonpost.com Aug 16, citing China’s local party mouthpiece Tibet Daily newspaper. The report said that in recent weeks Chinese officials in charge of the Tibet Autonomous Region (TAR) had ordered a run of stories in local newspapers promoting mixed marriages. Chen Quanguo, the Chinese boss of TAR, staged a photo-op with 19 mixed marriage families during a meeting with them on Jun 18, 2014, the report added. Chen has praised intermarriage as a “recognition of the great motherland, Chinese as a people, Chinese culture, and the path of socialism with Chinese characteristics”. He has called for government departments to use everything in their power and designate key officials to steer public opinion in favour of such marriages. Party and government officials should act as matchmakers, he has added. 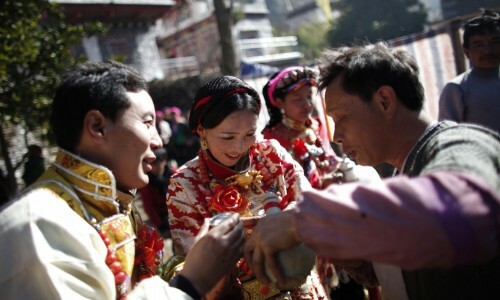 A report celebrating such policies published in Aug 2014 by the Communist Party’s research office in the TAR was cited as saying mixed marriages had increased annually by double-digit percentages for the past five years, from 666 couples in 2008 to 4,795 couples in 2013. While avoiding specifics, the report was said to attribute the growth of such marriages to favourable policies in areas like social security, reproduction rights, vacations, prizes and special treatment for children born from such marriages, including in the areas of education, employment and Communist Party membership. According to China’s official census, the TAR’s population is roughly 90 percent Tibetan and 8 percent Chinese. But critics contend that the actual Chinese population, held back from the census reports, is many times higher than that. In the rural areas of the TAR, the Chinese constitute the overwhelming majority already. While China claims in its official media reports that the effort at intermarriages is designed to achieve ethnic unity, critics argue that its true aim is to further weaken Tibetan culture and identity. Beijing-based Tibetan blog activist and writer Tsering Woeser has likened the promotion of intermarriage to the worst practices of colonization. Herself married to the Chinese dissident writer Wang Lixiong, Woeser has said there is nothing objectionable about couples as people from different backgrounds coming together naturally. However, when the authorities use it as a tool and create policies to encourage it, it feels wrong, she has told washingtonpost.com. She has compared the practice to that of Japanese police being encouraged to marry local women during Japan’s occupation of Taiwan. The report said that for weeks government-run newspapers in the TAR had featured happy mixed marriage couples in which the children loved both cultures and equally spoke Tibetan and Mandarin. Government policy requires mixed couples to choose early on what ethnicity to designate their children in official documents. Many choose to name their children as Chinese rather than Tibetan, believing that it gives their children a chance at a better life, the report cited a 28-year-old Tibetan woman who works at a local government department as saying, speaking on condition of anonymity.